Songs of Eretz Poetry Review: New Poem: "Saint John the Baptist in the Wilderness"
New Poem: "Saint John the Baptist in the Wilderness"
I started a new poetry collection with the working title Nelson-Atkins Ekphrastic Poetry. 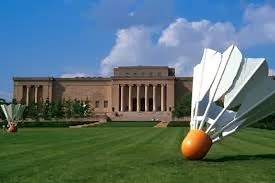 As the working title implies, the collection will house ekphrastic poetry inspired by the art in the Nelson-Atkins Museum in Kansas City (pictured). For more information about the museum follow this link: http://www.nelson-atkins.org. The first poem in this collection is after Caravaggio's painting, Saint John the Baptist in the Wilderness http://www.nelson-atkins.org/collections/iscroll-objectview.cfm?id=1130. I used a nice, Italian leather-bound journal in which to pencil in my poetry while observing the art in the gallery. Caravaggio's depiction of the Saint as a robust, nearly naked youth brooding in the wilderness easily inspired a contemplative poem.